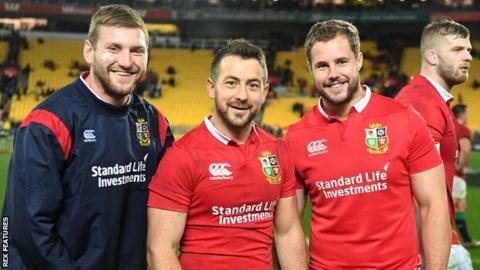 Finn Russell and Allan Dell have no regrets about joining the British and Irish Lions as mid-tour reinforcements. The Scotland duo were among six late call-ups to ease the burden on Warren Gatland's Test squad in New Zealand. The pair played a combined total of 15 minutes from the bench in two midweek games and will leave the camp this week ahead of the remaining two Tests. "It might never happen again," said stand-off Russell. "So you take it and make the most of it." The other four additions, all from Wales, did not feature at all, with Gatland admitting the controversy surrounding their presence influenced the decision not to bring them off the bench. A host of former Lions criticised the selection of players on logistical grounds rather than on merit. However, Russell and Dell have enjoyed the experience, despite missing out on the last Test of Scotland's summer tour, a defeat in Fiji, which followed wins over Italy and Australia. "I'm definitely glad I came out here; you'd really regret not coming out here," said Glasgow Warriors' Russell, who featured for five minutes as a temporary replacement for Dan Biggar in Tuesday's 31-31 Hurricanes draw. "We've only been here 10 days, it's been so quick. "We were on such a high after the Australia game, then we were flown out and one thing rolls into the other. "I guess in time it will sink in what it really means to play for the Lions, once we're back home and have a bit more time to think it through. "For the boys who were picked after the Six Nations, they had all the build-up, but for us it was a very quick turnaround. So you just jump straight in and give it a go in a completely different environment. "That's tough, but it's good fun, and it's been a good experience. It's a no-brainer that you come." Edinburgh prop Dell played a 10-minute cameo in the Lions' 34-6 win over the Chiefs and said: "It's something you jump at and could be a once in a lifetime opportunity. "Obviously it wasn't as much time as we would have liked, and we haven't been able to show what we're fully capable of, but it's still fantastic. "You don't come over wanting to just fill numbers, we're professionals, and you come over wanting to prove and to show you deserve to be in this scenario. "That's the bit of frustration, but we understand we came in with a role and a job to play, and we're more than happy to fill that job and be a part of it."